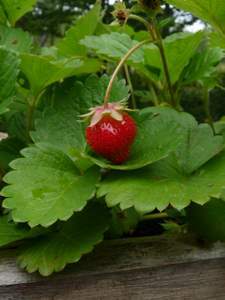 Whether you grow them in the Northern or Southern Hemisphere, one of the small fruits in your home garden that may present you with a slight but rewarding challenge to grow organically is the strawberry. These juicy globes of sweet taste will bring you great enjoyment at harvest time. Many proven varieties exist for you to choose from. You are only limited by which type that most appeals to your taste and climate. There are three types of strawberries, and these are classified according to the time of the season they will bear their luscious fruits for you to enjoy. The “June“- or Spring-bearing type produces one full crop for about three weeks in early Summer in the Northern and Southern Hemispheres. These plants produce large fruit and have many runners or offsets. “Kent” and “Veestar” are well-known one-crop varieties. As popular as they are, you won’t have any difficulty finding starter plants for your home garden. Buy your plants either established, in packs or punnets, or get them as bare-rooted plants. 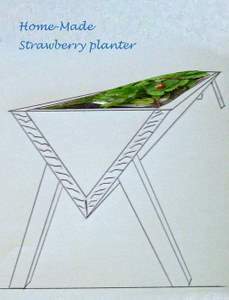 Strawberries send out runners from the mother plant that anchor themselves readily in the soil and start to grow as an independent, separate plant. That’s why a row of plants will soon become a thick bed within a few years if pruning between the rows is neglected. For the backyard grower, this is a good thing and that’s why strawberries can easily be grown in raised beds, enclosed beds, strawberry pots, containers or matted rows. My father-in-law grew his strawberries in a wooden container raised up off the ground that he built himself. He harvested many boxes of berries over the space of quite a few years, proving that, if kept well-fed and watered, strawberry plants will produce many crops over and over again. He lived in Queensland at the time and his growing method made perfect sense when you consider that ants, slugs and other critters also love the sweetness of strawberries just as we do. For Spring-bearing types of berries, plant in early Spring. If you live in a mild climate, i.e., the Southern Hemisphere, you may also plant this one-crop berry in the fall. The everbearing and day neutral types can be planted in the Spring in both Hemispheres. Place your berry plants 45 cm (18 in) apart in rows that are 75 cm (30 in) apart, and bury them up to, but not over, the crown. If the crown is buried under the soil, it may rot. Water deeply at transplant time. This is also the time to incorporate Mycorrhizae by spreading the pellets in the hole in which you are placing each plant. See further along for more information on this helpful fungi. To give your strawberry plants a great start in your garden, prepare their bed with care. Incorporate plenty of organic matter in the soil, such as compost, well-aged manure, worm castings, and if applicable, a balanced organic fertiliser blend. Strawberries grow best in loamy soil that has no weeds. Avoid planting them where crops from the Solanaceae (tomatoes, potatoes, green peppers and eggplants) have previously grown, as the soil may harbour disease that can be transmitted to your strawberries. Give your plants plenty of sunshine, at least six hours of sun a day, and, if rains are not frequent, make sure they are well watered at least once a week. The fruits will especially benefit from this, as they need water to grow to a plump, juicy size. If the berries remain too small, the taste is usually adversely affected. Strawberries need to have their soil pH level between 6.0 and 6.5 to grow into their optimum best as a productive small fruit crop. Test the soil before you plant, and incorporate dolomitic lime if the soil is too acidic, or garden sulphur if the soil is too alkaline. The amount required will depend on the soil’s pH level at testing and the size of the plot being treated. Follow the directions on the product packages. Do not disregard this very important step in the plant’s growth cycle. The soil is the source on which the plant relies for all its nutrients and the correct pH makes those nutrients available to the plant’s root system. Another important soil component, fairly new on the home gardening scene, but proven to be worth its growing popularity, is a friendly fungi called Mycorrhizae. A symbiotic alliance is formed between the plant’s roots and these microscopic living organisms, enabling the plant to absorb nutrients from the soil a lot more efficiently and effectively. Some soil producers add this fungi to their potting or garden products (usually in potting mixes) and if you ask your garden centre representative, they may be available in your area. To use this special product in your garden, sprinkle a handful of the mix in the bottom of the hole you are digging for your plants, then place the root ball directly over it, and finish planting as usual. Mycorrhizae is completely organic, and usually comes incorporated in pelletised form with perlite or vermiculite or other inert substance. Fish or Seaweed Emulsion - for nitrogen to keep the leaves healthy and green. Bone Meal contains phosphorus and will help with root development, in addition to the Mycorrhizae helping the whole plant. Wood ashes furnish the plant with potassium, and that, along with the nitrogen, will promote fruit formation and development. If weeds are overrunning your strawberry plot, use vinegar to eradicate them. One homemade solution is composed of two parts of vinegar to one part of water, a squeeze or two of lemon juice, and a squirt of dishwashing soap. Mix together in a spray bottle and drench the weed for maximum coverage. Be careful to not spray your strawberry plants, as vinegar is non-selective and will kill all plants, not just what we call weeds. It’s also biodegradable and, of course, totally organic. To keep aphids and other bitey pests away from your strawberry plants, use an Insecticidal Soap formula that contains Fatty Acids. Other suggestions are Neem Oil, a natural insecticide-miticide and, if going home-made is your cup of tea, steep several gloves of garlic in a bucket of hot water for half a day. Spraying your plants with this ‘tea’ will also effectively rid them of unwanted invaders. Consider straw to be your strawberries’ best friend. To keep the berries and plants clean, to keep the soil moist and to serve as a great winter protection, spread a layer of 8 cm, or 3.5 in, thick of straw mulch over your berry patch. This is how your plants will survive if you live in a cold climate. We have gone through the process of knowing the strawberry, planting and growing it, and finally giving it maintenance, care and protection. Growing strawberries can be accomplished with organic means to be assured of a healthy, clean and poison-free crop, grown in your own backyard. Nothing could be better, for your plants and for you!